April 13, 2018, Dublin, Ireland. How did the Sanitaire EON ALLERGEN Upright Vacuum Cleaner obtain the Certification? 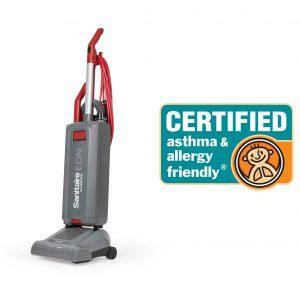 This ASP:03:01 Certification Standard is targeted to vacuum cleaner products that are scientifically proven to reduce exposure to asthma and allergy triggers. The Certification Standard utilizes an algorithm of proprietary and recognized scientific techniques to assess vacuum cleaners for their ability to reduce allergenic and irritant materials. Product samples that pass certification testing are granted a certificate stating that the particular vacuum cleaner item meets the requirements for the asthma & allergy friendly® ASP:03:01 Certification Standard. Assessment of the performance of the Vacuum Cleaner as the dust reservoir fills or the filter begins to clog with dust particles. Electrolux then obtained the certification after the products they sent for testing passed the tests and met the scientific requirements. “There is a growing awareness of the impact of indoor air quality and its effect on our health in schools, offices and other workplaces. The Electrolux Sanitaire EON™ ALLERGEN commercial vacuum cleaner has come through our stringent testing standards proving its ability to not only remove allergens from the environment, but to also reduce redistribution and exposure to the operator.” said Dr. Joey DeCourcey, Senior Scientific Officer at ASL. Since 1972, Sanitaire has built the longest-lasting and most serviceable commercial upright vacuums available, becoming a leader and innovator in the commercial vacuum industry. Sanitaire offers uprights, canisters, backpacks, floor machines, carpet cleaners, air movers and accessories for commercial cleaning. Many Sanitaire product are designed to achieve the CRI Seal of Approval and are LEED compliant. Sanitaire is part of the Electrolux family of innovative small appliance products. As their goal is to bring premium quality products to their consumers, certifying their products as asthma & allergy friendly® was a coherent step moving forward.